BROCKTON, Mass. – At the midway point of the season, the North Attleboro volleyball team was staring at a 3-6 record and a return trip to the postseason in jeopardy. But the young Rocketeers matured quickly, turning their season around over the final nine games. North Attleboro won seven of those contests, including an upset win over Canton, to book its place in the D1 South tournament. #10 North Attleboro showed its mettle in the match, rallying in the second set to tie the match at 1-1 but the #7 seeded Boxers (14-7) came back to win a tight third set and finished it off in four to secure a 3-1 win (25-16, 22-25, 25-21, 25-18) over the Rocketeers. North Attleboro showed some nerves in the opening set, hurting themselves with nearly a dozen unforced errors. 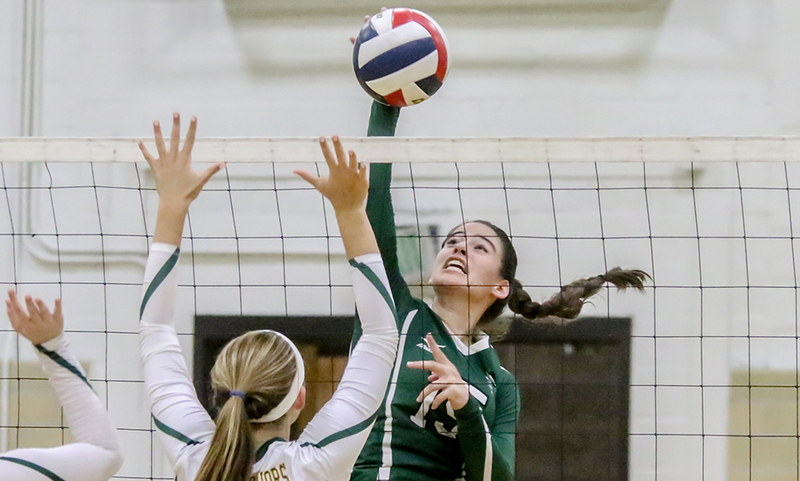 The Rocketeers hurt themselves with a couple of serves out of bounds, a half dozen hitting errors, and allowing Brockton’s serve game to finish with three aces. After the first 12 points were split evenly, Brockton used a run to create some separation. A kill from North Attleboro junior Grace Munley landed a kill to get North within three, down 13-10, but the Boxers pulled away. A pair of kills, a service error, and an ace from Brockton forced a timeout with the Boxers up 17-11. Brockton stretched its lead to 22-13 but North responded with three straight points to get within six at 22-16. However, the Boxers finished the game as North had back-to-back hitting errors and the Boxers secured the first set with a block kill. 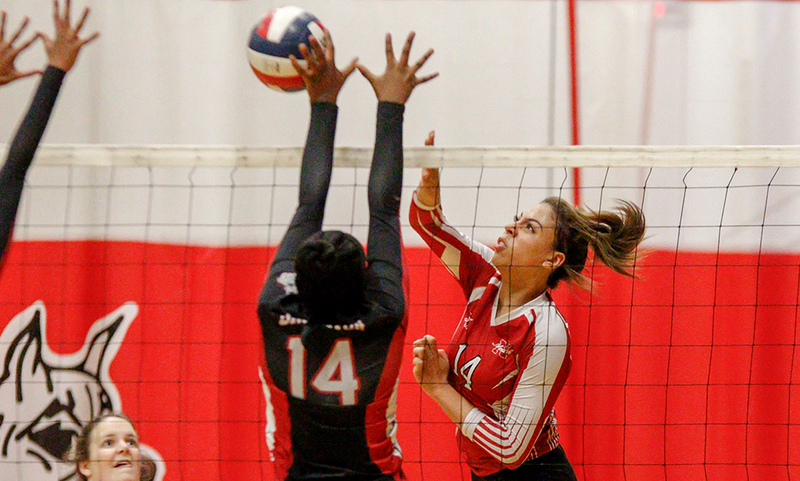 North Attleboro came out rejuvenated in the second set and jumped out to a 6-1 lead, with Munley and Tatiana Sotelo (13 kills, 10 digs) each recording a kill early on. While Brockton made a push to get back into it, a kill from Ryan Sullivan (eight kills) on a nice set from junior Hayley Gaskin (27 assists) extended the Rocketeers’ advantage to 11-5. Brockton refused to go away, getting within two points on a handful of occasions, coming within one point midway through, and even tying it late, but North Attleboro never relinquished its lead. A run from the Boxers cut the lead to 16-15, forcing Hallahan to take a timeout. North responded with two kills from each Sotelo and junior Eliza Dion to push the lead to 20-15. Brockton came back with. 5-0 run of its to tie the game but with its back against the wall, North answered with a 5-2 run. Sotelo had a kill, Brockton had an attack error, Melanson had some big swings resulting in a pair of kills and Dion ended the set with another kill to tie it 1-1. While Brockton had a strong start in the third set, North Attleboro stayed with the Boxers the whole way. Brockton led by as much as six early (11-5) but the Rocketeers continued to stay in striking distance behind a 6-2 run. In that run, both Melanson and Munley had a kill and Melanson had an ace – just one of two aces the Rocketeers had in the entire match. The see-saw battle continued with Brockton extended its lead to five (17-12) but North got within one by going on a 6-2 tear of their own. But similar to how the Rocketeers never surrendered the lead in the second set, Brockton never let its lead evaporate in the third, and finished it off, 25-21. North jumped out to a 4-1 lead in the fourth set but Brockton quickly took over and never looked back. The Rocketeers stayed within striking distance throughout, down three at 12-9, and got it down to two at 18-16, but that would be the closest North got. After a North timeout, Brockton closed the set, and match, out with a 5-2 run to win 25-18. “We knew at the beginning of the season that since we were young that there would be some hard times,” Hallahan said. “But we talked about being a second half team, we wanted to be strongest in the second half of the season. I know they have the talent, you could see it tonight, but we just need to continue to put the work in. I’m really proud of them, they had a great second half of the season. Tonight just didn’t work in our favor. North Attleboro volleyball finishes the season at 10-9 overall.